Fantastic news for Clíona from the #OUTBOX judges and team! Clíona has been selected to join 118 girls from Europe on a ground-breaking ‘Outbox Incubator’ programme in London to help young girls develop their science, technology, engineering and maths (STEM) skills. Earlier this year the sixth class pupils were invited to display their digital work at the Excited IT event in Dublin Castle. One of the founders of the Outbox programme was very impressed with their ability and recommended that an application be made to take part in the initiative. Along with pupils from the UK and Europe, Clíona will be joined by one other primary school girl and 16 secondary/college students from Ireland on the programme. They will spend from two to six weeks, over the summer, learning and living together under one roof in the Outbox Incubator house in London with all expenses paid. The programme is in partnership with WISE (Women in Science & Engineering), whose patron is Britain’s Princess Anne and is funded by Salesforce, the global cloud computing company. 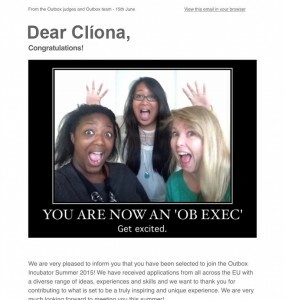 “The UK technology industry is facing a well-documented skills shortage, yet the number of women studying computer science at university is at an all-time low,” said Salesforce area vice-president Melissa Di Donato at the launch of Outbox. WISE will be supporting the project by providing mentors from its network of highly-skilled and inspirational female STEM members. 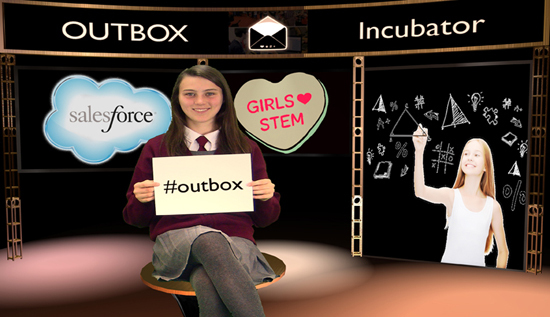 “The Outbox Incubator is an amazing way to nurture future STEM stars and we are delighted to be involved with Stemettes and the girls benefiting from this unique experience,” said Sarah Shaw, WISE communications director. The programme will form the basis for a TV documentary and give the girls an opportunity to meet inspirational role models and share the experience with other like-minded individuals. It’s a great endorsement of the use of increasingly advanced computer programs in the school over the years. It’s also the start of a very exciting journey for Clíona and along with her family we are all very proud. Great achievement at such a young age. Well done!